The salon that you choose should offer you personalized service with every visit. Now you can get that same level of customization even before you cross our threshold. Salon D’Artiste is proud to offer our clients a free mobile app that will let you have access to a full salon front desk right from your mobile device, and you won’t even need to make a call. 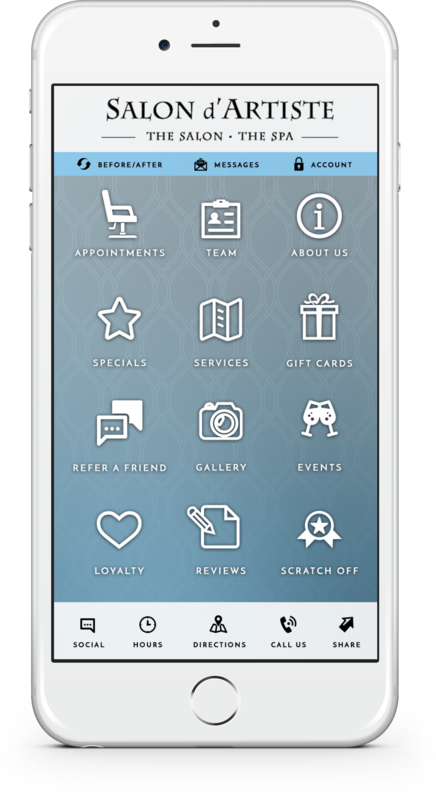 Our mobile app gives lets you browse our full menu of services to find exactly what you want. Then, select the day and time that will work best for you, and book it. As soon as your appointment has been confirmed, you’ll receive notice of it right through the app. And you’ll be able to follow up with the details of your new appointment through the app too, all without ever dialing a phone number. This mobile app is much more than a simple scheduler. You can also use it to purchase a gift card redeemable for products or services. We’ll even send it out to the recipient of your choice for you. Refer a friend to our salon, and keep track of your loyalty points, too. Find out about our current events and specials, and follow us on social media. You can do it all right through the app. Learn about our service hours, and get directions to the salon from wherever you happen to be. It’s a full salon concierge service just for you. Here at Salon D’Artiste our team is always exploring ways in which we can help you look and feel your best, and that includes making it even easier to pay us a visit. That said, we’re also very happy to speak with you in person. Feel free to call us on 610.687.2020 or come and see us at the salon at Eagle Village Shops at 205 Lancaster Ave. #2 in Wayne. We’ve been on the forefront of day spa experiences since 1985 and our mobile app is just one more way to make your experience the best it can be. Download it for free from the Apple Store, GooglePlay, or Amazon.